They are proteins (including antibodies), nucleic acids (DNA, RNA or antisense oligonucleotides) used for therapeutic or in vivo diagnostic purposes, and are produced by means other than direct extraction from a native (non-engineered) biological source. Biopharmaceuticals are medical drugs produced using biotechnology. They are proteins (including antibodies), nucleic acids (DNA, RNA or antisense oligonucleotides) used for therapeutic or in vivo diagnostic purposes, and are produced by means other than direct extraction from a native (non-engineered) biological source. The first such substance approved for therapeutic use was recombinant human insulin (rHI, trade name Humulin), which was developed by Genentech and marketed by Eli Lily in 1982. The large majority of biopharmaceutical products are pharmaceuticals that are derived from life forms. Small molecule drugs are not typically regarded as biopharmaceutical in nature by the industry. 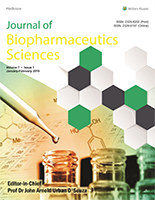 Journal of Biopharmaceutics Sciences (ISSN: 2329-8200, eISSN: 2329-8197) provides a medium for publication of novel and innovative research from the areas of Pharmaceutical Technology, Pharmaceutical Biotechnology and Biopharmaceutics. The journal will cover technical and clinical studies related to health, ethical and social issues in field of Biology, biosciences, Pharmacy & pharmaceutical sciences. Articles with clinical interest and implications will be given preference. Journal of Biopharmaceutics Sciences, a publication of International Water, Air and Soil Conservation Society (INWASCON), is a peer-reviewed print + online Semiannual journal.